The Very Hungry Caterpillar was written by Eric Carle and published in 1969. The children's book is about caterpillar who eats its way through a wide variety of food before emerging as a butterfly. Amazingly, the book has sold 30 million copies worldwide. The story highlights different life stages where transformations take place, such as- metamorphosis. I personally as a child just adored the book, especially my older brother. He would recite the story again and again because he knew it so well. 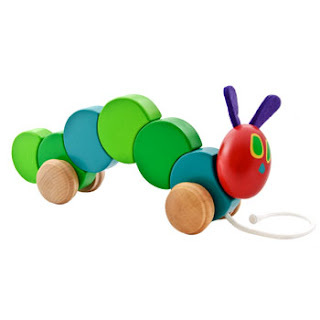 In our Toyday shop we have the loveliest, Very Hungry Caterpillar wooden pull along for babies and toddlers that I wish myself and my siblings had at a young age! It's a perfect toy for children that know the story and the caterpillar's character.